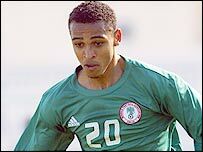 Blackburn are giving a second trial to Nigeria striker Osaze Odemwingie. Odemwingie, 23, impressed Rovers boss Graeme Souness in a spell with the club over the summer and has now been given another chance to impress. Blackburn chief executive John Williams told the club's official website: "We have had a good look at him but as yet no decisions have been made." Odemwingie, who impressed in the African Nations Cup, currently plays for Belgian side La Louviere.